So now that I'm finally getting around to these, the Princess Half Marathon Weekend is kicking off and well this is the best way I can beat the "I wish I was running! "-Disney blues. After the 5k we went to Animal Kingdom and probably walked around a bit too much. I woke up bright and early and we were on a bus right around 4:10am for the 5:30am start of the WDW 10k! Confession time - for the 10k Jenny and I had coordinated probably my favorite runDisney costume ever. Seriously, so excited to wear this and look how cute we are! 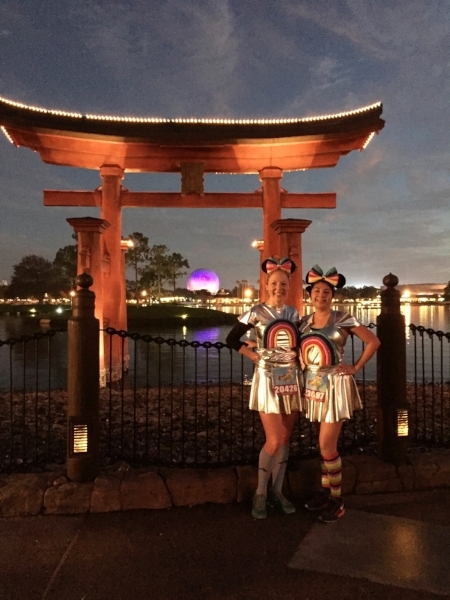 It was a Flashback Friday runDisney 10k for sure that day with our ode to opening day Epcot! We met up with the running Ohana and mingled for a bit before heading to the corral. The weather was awesome and while I was battling a cold (a pretty nasty head cold) I was feeling good enough to tackle some more miles. With a 3-2-1 count we were off! We ran out the parking lot, through the Epcot car entrance and made a U-turn up the ramp. We kept trucking along the roads outside Epcot until we entered Epcot between Mexico and Norway. When we got there we met some fierce-some vikings! We then kept cruising around and once again, Epcot is just the best in the pre-dawn hours! Once we passed France it was time to head out to the Crescent lake loop. I really just love this part of the race, there are always enthusiastic cheerers out and it's just so beautiful. We finished the loop and entered through backstage before coming back into World Showcase to a BE-A-U-TIFUL sunrise! It was then on to Future World for a quick run through Future World before exiting Epcot and crossing the finish line of race #2 of the Dopey Challenge. This was one of my favorite races yet. Great running partner and a really fun costume, if only my pesky cold would've been a little less it would've been perfect.